Welcome to Paradise Found on Maui’s Sunny South Shore . . . Just Steps to the Sand at Beautiful Kamaole Beach . . . at the Gateway to Prestigious Wailea. Nestled on 15 Tropical Acres Featuring Cascading Waterfalls and Tropical Fishponds, Stroll through the Property’s Award-winning Grounds as the Gentle Tradewinds Caress your Senses and the scent of Fragrant Plumeria permeates the air. Enjoy Casual Island Living Oceanfront . . . Just Steps to the White-Sandy Beach . . . 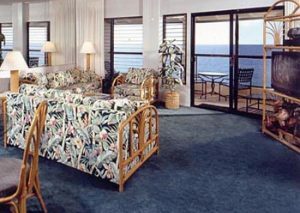 Featuring your Choice of Beautifully Appointed 1-Bedroom, 2-Bedroom & 3-Bedroom Deluxe Maui Vacation Condo Rentals . . . at stunning Kamaole Resort. Experience Breathtaking Sunsets and Savor the Stunning Oceanviews from the Privacy of your own Spacious Lanai . . . While Relaxing in Comfort & Style Enjoying Your Favorite Tropical Drink . . . Just steps to the sand. 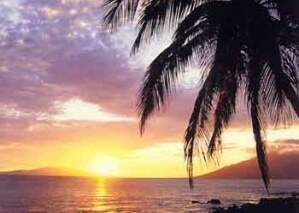 The Warm and Gentle Waters of Beautiful Kamaole Beach Beckons your call. 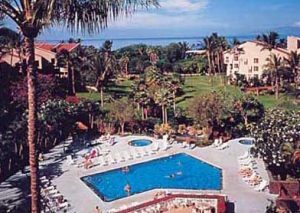 Your Maui Condo Rental is Beautifully Appointed in an Island-Rattan Decor, and Features Fully Equipped Kitchens, TV’s/DVD Players, Internet Access and A/C . . . Framed by Gently Swaying Coco Palms. With Famous Mt. Haleakala as the Background, and the Island of Lanai & the Stunning White Sands of Kamaole Beach right outside your door . 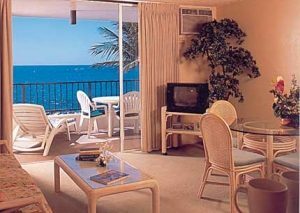 . . you’ll never want to leave your Maui Vacation Condo Rental at Kamaole Resort! For your Added Vacation Pleasure, take a Refreshing Dip in the Pool . . . then Relax in the Spa or bask in the warm sunshine on our sundeck. At days end, enjoy your ‘fresh catch’ on our Gas BBQ’s then take a long stroll on the beach. For the Sports Enthusiast, There are four Tennis Courts . . . and Five (5) Championship Golf Courses nearby. There’s even a wading pool for the kids. Just Steps away, be our guest on the Stunning White Sandy Beach . . . Simply ideal for swimming, snorkeling, sailing and scuba diving. Shops & Restaurants are just Moments away. Welcome to the Ideal South Shore Maui Getaway . 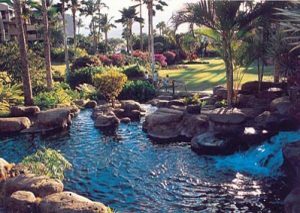 . . Just Steps to the Sand at the Gateway to Famous Wailea . . . Featuring Breathtaking Oceanviews in a Stunning Tropical Setting . . . at Kamaole Resort. 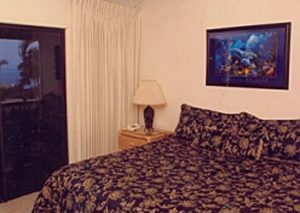 Your Maui Tropical Vacation Getaway features your Choice of Deluxe l-Bedroom Maui Condo Rentals that sleep 4 Guests; Spacious 2-Bedroom Maui Condos that accommodate 6 People; Or Stunning 3-Bedroom Maui Vacation Condo Rentals that sleep 8. All Linens & Towels Provided. Ideal South Shore Locale . . .